On Monday 14 August the CRL team were pleased to make a trip to Field Brighton to experience how our sister co-working space operates, as well as to see first-hand all of the great things that have been achieved there. Field Brighton was set-up in early 2016 at Preston Barracks, a disused former military site that had fallen into disrepair, to provide a diverse selection of Brighton & Hove based entrepreneurs with a temporary, rent-free space, as a means of fostering and growing their businesses. The temporary space, funded by Coast to Capital LEP and U+I, also includes a wood workshop, a bike hub, space for a Brighton University funded community project and a café. The businesses that have made their home there include: Play Talk Learn, Intrepid Camera, Control Freq, Flux Cycle Works and P Kirkwood. Once the current site is closed there are plans for a 50,000 sqft campus for product design and technology start-ups and small businesses to open in its place. Our tour of the site was a great opportunity for the team to see how the current occupants operate within the space and also how they support one another. Given the building was originally built for military training, it’s incredibly sturdy and it was interesting to hear that, although it had been badly neglected for a number of years, only a few modifications were needed outside of a lick of paint and some TLC in order for it to be repurposed. 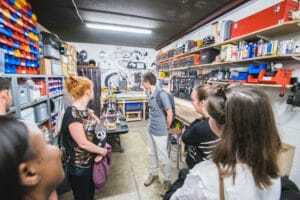 We happened to see Intrepid Camera mid production (makers of ‘The Intrepid 8×10’ a lightweight, high quality, affordable Field Camera), it was fascinating to find out a bit more about their process and to see how they used the workshop space. We also had a chance to catch-up with Control Freq Director, Noel Sesto, who briefly discussed the exciting plans for their revenue generating mobile solutions for the taxi and parking industries. Once the space is closed all of the current tenants have decided to stay together. A key aim of the current project was always to inform the design of the larger-scale campus for product design and technology start-ups set to built in the location; the new site will be more in line with the model that Central Research Laboratory is built on. The businesses use of the current space – their needs, how it’s evolved with them using it, what else they require – all make for valuable intel that will be used to inform the design of the new premises. The building in its place will be more similar to CRL in terms of its capabilities, but at its core will continue with Field’s good work of giving product design and technology entrepreneurs the space, facilitates and support to thrive. The new product design campus, which is part of the wider plans to regenerate the North of Brighton, aims to create 700 jobs over 10 years. U+I have been selected as the key partner in bringing the site forward.